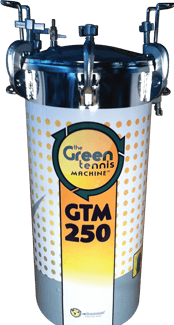 and his high caliber staff at Grey Rock, including Dennis Ralston, were one of the first clubs to invest in the quality of their tennis balls through the purchase of a Green Tennis Machine. My name is Fernando Velasco. I’m the owner, Manager and Director of Tennis at the Grey Rock Tennis Club in Austin, Texas. We were fortunate to receive one of the first ball machines in Texas. We have been using it for the last 3 years. We use it every week, together with our teaching balls, the 10 under balls, ball machine balls. It has been a great service for us to be able to provide to the members with quality of tennis balls that are always consistent, the bounce and consistency for the teaching area of our club. We have been able to educate our tennis pros to get into our cycle. Most of the time is we have the big machine, we have two baskets they come and then get recycled at the same time. We have 3 bins in our storage area. One, balls to be recycled, balls that are to be donated and the third balls that need to be that we will just recycle, you put a date on it. So members of our staff comes in, they take two baskets, put them in the recycler, they take the one out of the recycler and put them in their bins and they are happy. Now, the next two and half days later, the next two pros come in they’ve recycled them. So, we have got it into a real nice routine that the pros learn to get into the rhythm and be able to come in, get the new balls and be able to that. But the most important thing that members have appreciated the effort that we are trying to provide them with always quality of tennis balls when they are given their instruction. Their operation is very simple. It doesn’t take that much time to operate the system. You have got to get into a cycle. You have got to get into a system that the pros benefit from it. The tennis balls are like a surgical tools. They need to have good quality tennis balls to provide good instruction. In order to keep the members happy, the quality of the balls is important as the type of instruction that are given to the particular customers. That is why they benefit from it. They [customers] don’t get that in the court, and say the ball is dead, the ball is too hard, or it’s too soft. There is a consistency of the balls that are coming in. Also we have been able to save a tremendous amount of money for the club. I Had to cancel some of the shipments of balls that I was receiving automatically, because some of the balls, especially in the winter times are going to get softer and you still got plenty of fuzz. We’ve been able to recycle them, and not having to get the shipment coming in, and being able to save that money. So, it not only being a quality of instruction, the quality of balls, the quality of consistency of the bounce, but also the saving. We have been able to recoup our investment that we made. reBounces Wins South Central Cleantech Open!